Digital fiction is still where the most mind-breaking and visually seductive stories take place. But as technology advances the opportunity of creating interesting visual experiences expands to a wider group of creatives. Speaking to the humans senses in digital and physical form simultaneously creates great and memorable experiences. In this virtual fashion app a digital fashion show appears just at the palm of your hand. 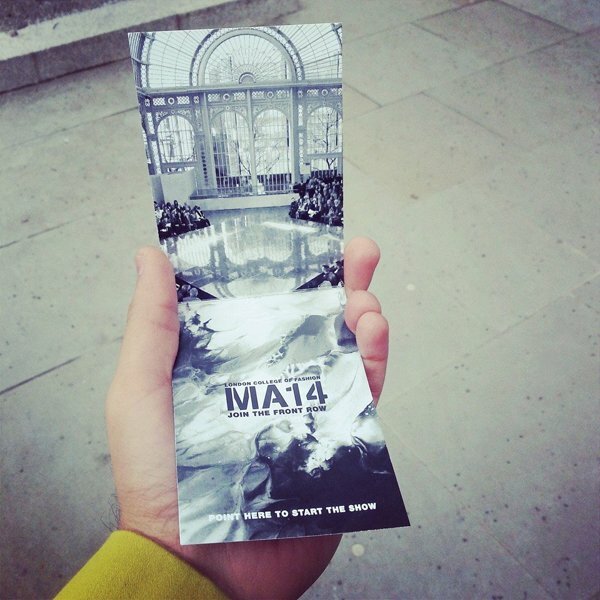 By printing out an online available catwalk card and downloading the augmented reality app, the user points at the card and a 3D-catwalk pops up. The show gives you front row to London College of Fashion graduation show and was developed by students Chirag Grover and Tanisha Arora in collaboration with augmented reality specialists Holition and media partner Shopping Spy. There’s no doubt that augmented reality has the potential of disrupting the concept of fashion shows and its alternate futures.